Conventional prostate cancer risk stratification results in considerable heterogeneity within each prognostic group. Of those men classified as being high-risk of treatment failure and prostate cancer related mortality, men with Gleason score 8 with otherwise low-risk features have been identified as a favorable subset. Prostate brachytherapy monotherapy has historically been reserved for men classified as low-risk. 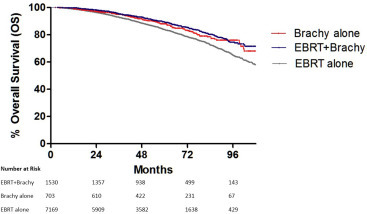 In light of recent randomized data validating improved cancer control with the addition of LDR brachytherapy, we sought to evaluate patterns of practice and survival outcomes for these patients. We queried the NCDB for clinical T1c-T2a N0 M0 prostate cancer with presenting prostate specific antigen (PSA) <10 ng/mL and Gleason 8 disease on biopsy. All patients were coded as having received androgen deprivation therapy (ADT) and either external beam radiotherapy (EBRT) alone, brachytherapy alone, or a combination of EBRT followed by a brachytherapy boost (EBRT+brachy). Patients undergoing surgery were not included in this analysis. Retrievable data included age, race, insurance status, median income, facility type, distance to treating facility, Charlson-Deyo comorbidity score, year of diagnosis, stage, and radiation modality. An odds ratio for utilization of radiation was generated using year of diagnosis as a continuous variable. Kaplan-Meier overall survival (OS) estimates were generated, with accompanying univariate (UVA) and multivariate (MVA) Cox proportional hazards regression analyses. Propensity score matched (PSM) analysis was performed to account for indication bias and mitigate heterogeneity between treatment groups. 4562 patients meeting inclusion criteria were evaluable with a median follow-up of 62.5 months (range 2.3 – 119.8 months). For the entire cohort, median age was 72 years (range 41-90 years); 78% white, 67% Medicare insured, 76% with cT1c disease. 3336 patients received EBRT alone, 395 patients received brachytherapy alone, and 830 patients received EBRT+brachy. Utilization of any form of brachytherapy decreased over time. 31% of patients received brachytherapy during the first half of the study period (2004-2006), and this decreased to 22% during the latter half of the study period (2007-2009). The odds ratio for utilization of brachytherapy by year (continuous variable) was 0.86 (p≤0.001). On UVA, OS was significantly shorter with low median income, Medicare insurance, increasing comorbidity score, and treatment with EBRT alone. Five-year OS was 84%, 88%, and 89% for the EBRT alone, brachytherapy alone, and EBRT+brachy groups, respectively (Figure 1). On MVA, high median income, low comorbidity score, and treatment with brachytherapy alone (HR 0.66, p=0.004) or EBRT+brachy (HR 0.69, p≤0.001) remained associated with longer OS. PSM groups were well-balanced for all patient- and disease-specific factors between treatment groups, and Cox proportional hazard analysis of PSM groups confirmed longer OS associated with both brachytherapy alone (HR 0.60, p=0.004) and EBRT+brachytherapy (HR 0.68, p=0.002) relative to EBRT alone. 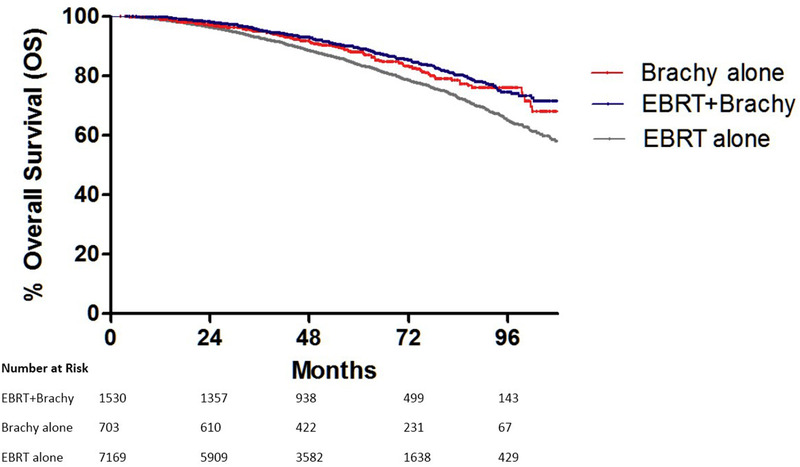 Of those men with Gleason score 8 prostate cancer as their only high-risk factor treated with ADT, longer overall survival was achieved when prostate brachytherapy was included, whether utilized alone or in combination with supplemental EBRT. The proportion of men receiving brachytherapy as a component of care continues to decrease significantly in the United States. Further investigation of prostate brachytherapy monotherapy for select high-risk patients is warranted.